We do not share our mailing list with anyone EVER. Open Communication offers a variety of services to assist individuals, couples, families, educational communities, businesses and organizations in developing communication skills to cultivate compassion and peaceful sustainability. 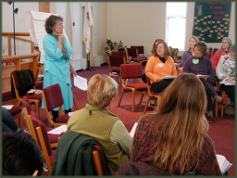 These 1 – 2 hour events give a group an overview of NVC, Empathy or Restorative Circles. The participants will experience how these topics can strengthen compassion and peace in their organization, school, or business. For schools, organizations and businesses that want to integrate NVC or Restorative Circles. Private coaching for individuals or couples in NVC or Empathy. "This training was excellent. I found Peggy's explanations and exercises very useful and gained many new insights.""